You've jumped on one trampoline, you jumped on them all, right? Wrong, you cynical sad sack. The mother of all trampolines is currently being readied for its public unveiling inside a series of caverns in Wales. 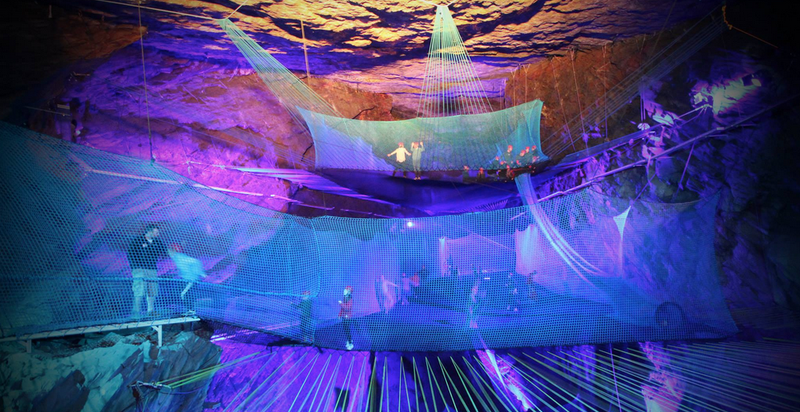 Yep: It's a network of trampolines hung from the walls of an old slate mine. In the Welsh mining town of Blaenau Ffestiniog, an entrepreneur named Sean Taylor, who specializes in adventure tourism—including the fastest zip line in the world—is about to open up a new attraction: Bounce Below, a maze of trampolines installed inside of the Llechwedd Slate Caverns, a former slate mine that's now a tourist attraction. It's a one hour activity where customers get dressed up in a cotton overall and given a helmet, they then jump on a train and travel inside the mountain. They then disembark into a cavern twice the size of St Pauls Cathedral, there are three giant trampolines with three meter net walls to stop people climbing out, each trampoline is linked by a slide to go down and a walk way to go up, the biggest slide is 60ft. From the bottom platform you then go on a net walk way with a spiral staircase coming out on the other side of the railway line. The experience is unique, no where else in the world can you do this kind of thing. Also there is an amazing light show as you go round. Images: Big and Clever Adventures/CNET.